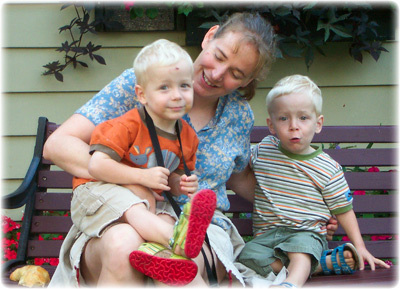 Vera C. Teschow is a certified teacher and mother of 9-year-old twin boys, Alex and Simon. She holds a Masters Degree in Education from the University of Toronto, and volunteers on Multiple Births Canada’s Health and Education Committee, as well as with a number of local organizations. Vera also writes for several publications, including “the Bulletwin”, “Multiple Moments” and the IAAC’s “Creating Families”. When not teaching or writing, Vera enjoys making music and devouring vegetarian cuisine. Joel Rendall is a professional musician and web designer from Ontario, Canada. He studied in the contemporary music degree program at Humber College in Toronto, ON, performed for 3 years on a cruise ship and is now living in Lisbon, Portugal. He has completed over 40 web design projects, and has been working with Vera for over 7 years. We believe in Equity and Social Justice. We are grateful for all we have, and we donate a portion of our profits to help multiple births families in need. Please see our Project Page for more information. We believe everyone expecting multiples has a right to affordable and accessible prenatal classes. If cost is a factor for you, please contact us, and we may be able to work out an arrangement.